Map showing trapping (white) and capture (red) sites to date for invasive European green crab in Padilla Bay. Click to enlarge. Another stunningly beautiful day to explore Padilla Bay (read about day 1). Day two of our rapid response trapping effort is complete; our teams checked all 192 traps at 31 sites, released native critters and refreshed the bait for an additional day of trapping. Unfortunately, two additional invasive European green crabs were captured by our traps over the last 24 hours – both young of the year females. One was found about three quarters of a mile north of the original sighting, and the other was captured 3 miles to the south, in Big Indian Slough. 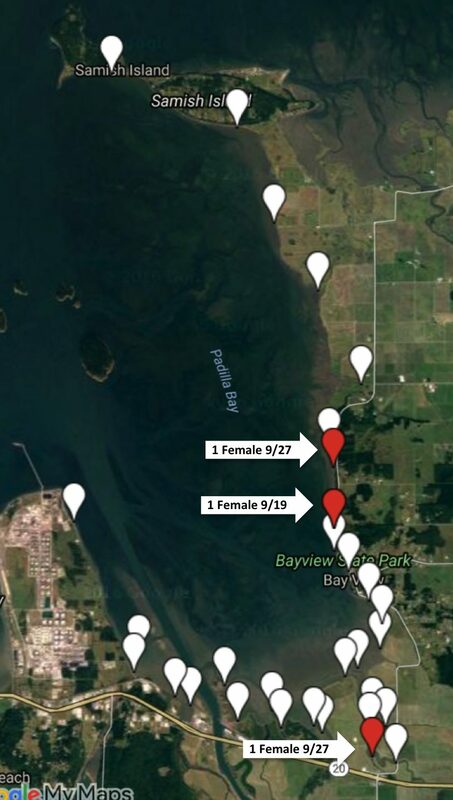 Both crabs were captured in salt marsh habitat, in the minnow traps we use, and might be part of the same cohort as the crab found last week by Padilla Bay NERR staff. All 190 of the other traps had only native critters in them, a hearty mix of Dungeness, rock, graceful, and purple and hairy shore crabs, as well as a few fish species. Finding additional crabs of the same size suggests that a group of larvae could have washed in on last winter’s warm waters. 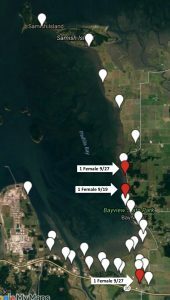 Notably, all three crabs that have been found in Padilla Bay were female. While they are large enough to be reproductively mature, dissection will be necessary to confirm their reproductive status. The traps have been reset and will fish (or crab, really) for another 24 hours in the same locations. Why reset them in at sites where we didn’t catch any green crabs? Video observations suggest that not all crabs in the area necessarily enter a trap. Some just hang around the outside, perhaps either because they can’t figure out how to get in, or because there are too many other crabs already in the trap. 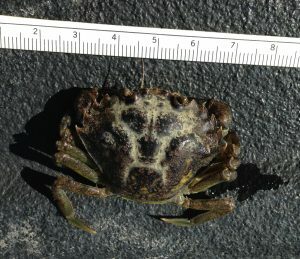 We clearly saw that it can sometimes take repeated trapping efforts to capture a very rare crab; in Westcott Bay, volunteer traps captured the first European green crab after a couple of months of monitoring in the same spot. This underscores the importance of ongoing vigilance. 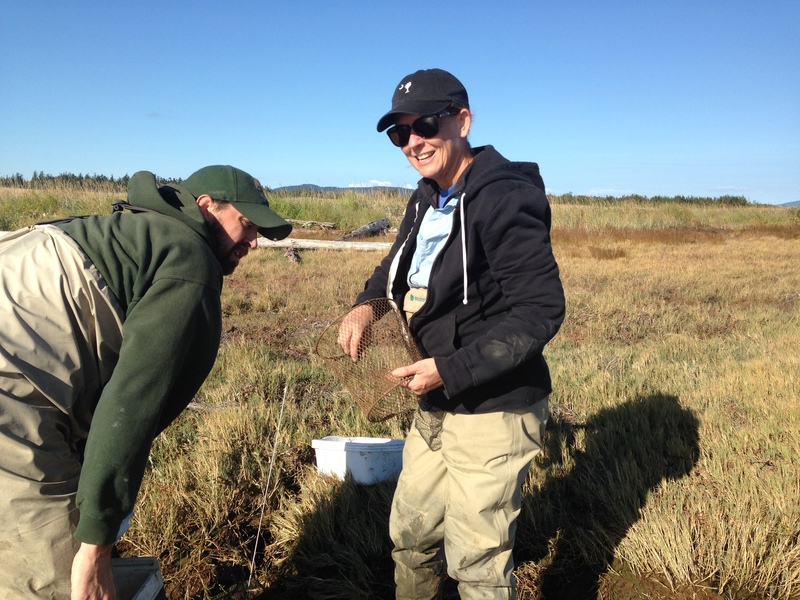 Richard Visser (WDFW) and Suzanne Shull (PBNERR) refresh the bait in a minnow trap, similar to those that captured 2 additional European green crabs in Padilla Bay today. (Photo: Emily Grason). Our teams are working smoothly together now. Each team has at least one person from each of the participating institutions, Washington Department of Fish and Wildlife, Padilla Bay NERR, and WSG Crab Team, all of whome are essential to the effort. The Padilla Bay research staff knows everything about our sites, how to get to them, their history, and seasonality. WDFW team members draw on an extensive background in rapid response and control measures with aquatic invasive species, helping maintain best practices, and kitting us out with field gear to schlep traps around. Crab Team works hard to “think like a European green crab”, identifying niches we think offer the best chance of nabbing a crab. It’s a truly collaborative effort that expands the network of researchers and agency staff who are equipped to help protect Washington’s shorelines from this global invasive species. We will report tomorrow about our final catches what might be next for monitoring in Padilla Bay. Until then, enjoy a glamor shot from today’s field work. There’s more! Read the final summary of our assessment in Padilla Bay. Return to Crab Team home page.